Rally the Readers: Harry Potter Moment of the Week (60): Which Weasley Character Would You Be? Harry Potter Moment of the Week (60): Which Weasley Character Would You Be? Which Weasley Character Would You Be? Out of all the Weasley characters, I believe I would be Fred Weasley. I like to think that Fred and I share a lot of the same qualities: an appreciation for humor, practical jokes, rebellion, and family. Fred is close to his siblings, most especially George, and I have that in common with him. I would do anything for my brother and sister. Also like Fred, I turn to jokes and laughter in stressful situations. When George lost his ear in Deathly Hallows, Fred couldn’t help but make jokes about it; that is something I definitely would have done, lol. I also wouldn’t have been able to stand Umbridge and would have most certainly left Hogwarts to spite her. Although Fred and George are quite similar (they are twins and all), I do believe they have several differences, and that is why I think I resemble Fred significantly more. Great pick!! I love the twins, but I'm nowhere near as funny as they were. I always admire people who have such great comedic timing and an infinite amount of jokes and humor. They can be funny without even trying. 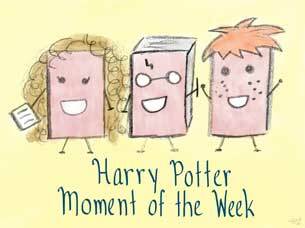 I chose Molly for this week's HP MOTW!